Where do you stand when it comes to freezers? Are they a baker’s best friend, a modern monstrosity or simply a necessary evil? If you like to bake as much as I do, you’ll be familiar with the issue of leftovers. While our household has as large an appetite for sweet treats as the next (ok, possibly ever so slightly larger), sometimes there’s simply more than we can manage. And while one of the best things about baking is sharing the spoils with family and friends, if they’re not around the freezer can be a lifesaver. A good way to spot the signs of an obsessive baker is by having a rummage round their freezer. Amongst other things mine contains: a labeled bag of egg whites leftover from a custard based ice cream (and perfect for future macaron making); some scraps of shortcrust pastry; a log of chocolate chip dough ready to be sliced for freshly baked cookies; and two rounds of chocolate almond cake hidden away after I had to remake dessert for someone with an unexpected nut allergy. Other than that, I don’t use my freezer all that much. I’m slightly scared of leaving anything in there for too long and never completely convinced how great it is for things like bread and meat which seem to lose both flavour and texture in the freezing process. Petit pois are about the extent of my concession to freezing anything other than baking leftovers plus, at latest glance, a bag of ice, some berries, a wine cooler and a tub of my precious sourdough starter. Oh, and a small tupperware of these. I made these crunchy little hazelnut meringue cookies just before we left for Italy, wanting to make sure the recipe worked and that I could replicate it once we were abroad. We ate some that night with ice cream and a couple more the next day crushed into a simple chocolate mousse, but knowing that we’d then be leaving the country for over a week, I stashed the rest in the freezer. Yesterday we went to visit a photographer to discuss plans for our wedding next year (excited? Who me?!). After arriving home late and throwing together a simple supper of fresh crab, courgettes and cannellini beans, I still craved the satisfaction of something simple and sweet. While I think brutti ma buoni are rather lovely in their own misshapen way, it certainly doesn’t do them any disservice to be crushed into crumbs. The high percentage of nut in each cookie adds a lovely texture when folded through soft whipped cream while a dash of tangy yoghurt offsets the sweet, ripe peach. If you can’t be bothered to make brutti ma buoni, you could easily substitute meringue in this recipe, making it more of a traditional mess – just up the hazelnut quantity slightly for that lovely contrast in texture and toasty flavour. And if you can be bothered, but aren’t quite sure how you’re going to eat them all at once, stick a few in the freezer for a later date and an (almost) instant, delicious dessert. In a medium bowl, whip the cream until soft peaks form. Crush the raspberries lightly with the back of a fork then stir through the cream along with the vanilla seeds and yoghurt. Crush your brutti ma buoni or meringues into rough chunks. Stir through the cream mixture. Spoon a small amount of cream mixture into four individual glasses or bowls. 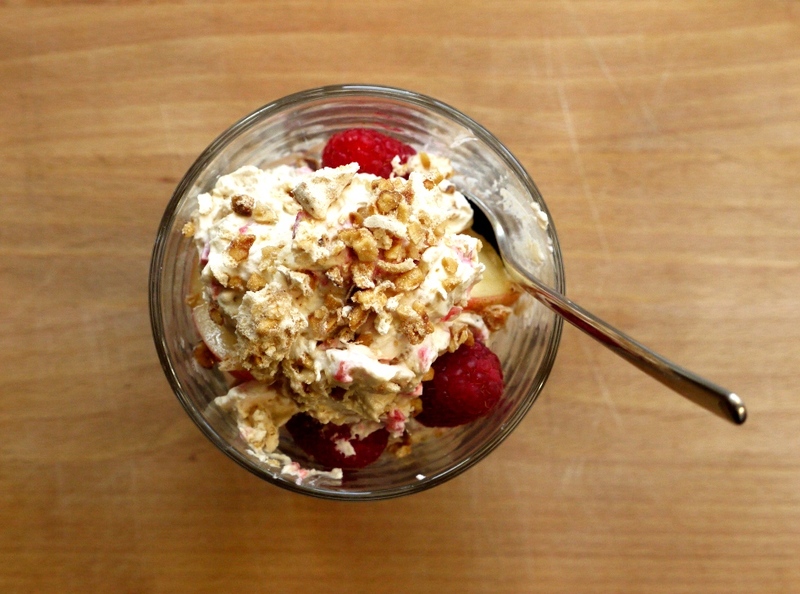 Top with a couple of peach slices, raspberries and a sprinkle of hazelnuts. Add another scoop of creaminess and repeat the layering process, finishing with a final scattering of nuts. Serve immediately if you like your meringue to remain crispy. If you prefer something altogether softer, allow to rest in the fridge until ready to eat. I live in the countryside and life would be horrible without a freezer, or two! Brown bread, half a lamb, cookie dough rolls in lots of flavors, summer fruits veggies and rhubarb from the garden and batches of ragu, stews and casseroles all labelled and dated live in there. Mary Berry is the queen of the freezer and will come to your house and slap you round the chops if she reads this post. Be afraid! Very afraid! Fantastic post. You’ve described my freezer and I love your attitude to food. The biscuits are sensational and I’m making them today. Very glad that I’ve found your blog. Kate this looks absolutely lush!! I love that you make the brutti ma buoni yourself – it looks like the perfect treat! My freezer is a black hole. I’ll put something in there with the intention of saving it for later, but end up completely forgetting about it. This is the fate of a lot of meat—there’s a little butcher shop up there, haha. Also, you are on top of it with this whole wedding planning business! I’m getting married next summer as well, and hope to get a venue booked… soon? Sounds like you have the freezer of a true baker. Mine’s about the same 🙂 Your eton mess looks delicious and I love how you used the biscuits from your freezer. Also, I hope you are enjoying the wedding planning! I’m very excited for you! I love all the flavours and textures in this dessert, perfect for the end of summer! I love the freezer even though I barely bake at all! It doesn’t mean I can’t fill my freezer with all kinds of grains and pulses and homemade soups and blanched corn and green beans. 🙂 That said, hazelnut meringue and berries and peaches together sound right up my alley. I can’t decide what I want more..this or the salty bourbon Pecan squares! I have so much catching up to on blogs..but I sit here and just stare at all of your incredible creations! 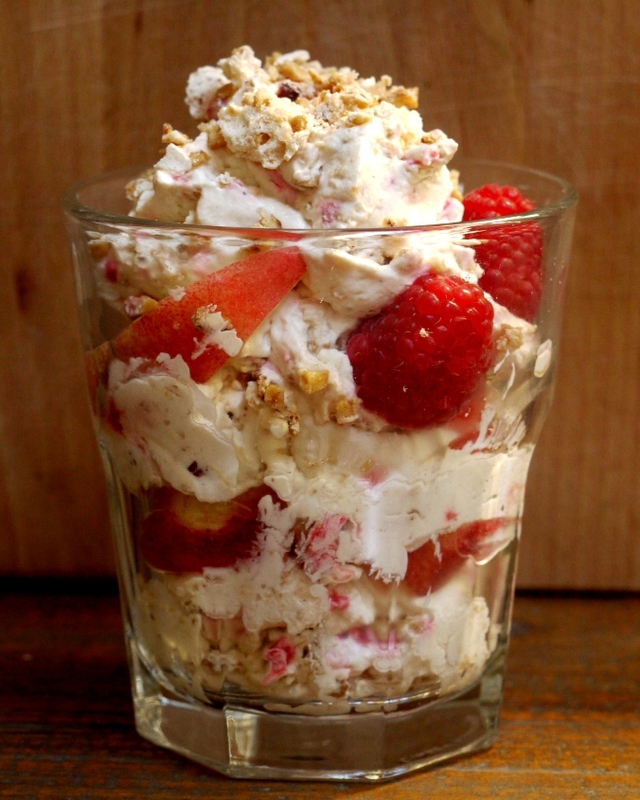 I ‘think’ I’ve had Eton Mess once…but if I’m going to have it ‘again’ I want your version! 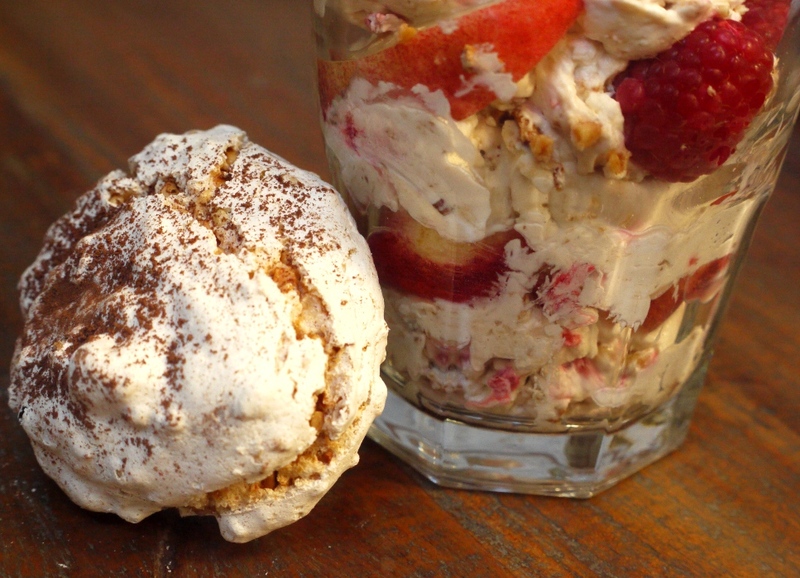 I’ve not tried freezing cookies before, but looks like it worked out well for you – what a delicious looking eton mess that is! Learn to love your freezer and you won’t regret it. My advice is keep things in there for as short a time as practicable. Freeze as quickly as possible and for baked goods freeze as soon as they are cool. Double wrap and pack in boxes if possible. For a recent even I froze 150 scones and cakes and biscuits for 70 people and all was well. Am going to try this recipe ..it looks fab. Thanks . My freezer is always packed full, it’s definitely a lifesaver for me. Nickki – it isn’t is it? However much people try to persuade me to use my freezer for meat, I just don’t think it’s as good. Frugal Feeding – agreed, food waste is a very bad thing! Kathryn – haha, we can be scared together! Baking Addict – I am! Lisa – this blog isn’t about either/or…you should definitely try both! 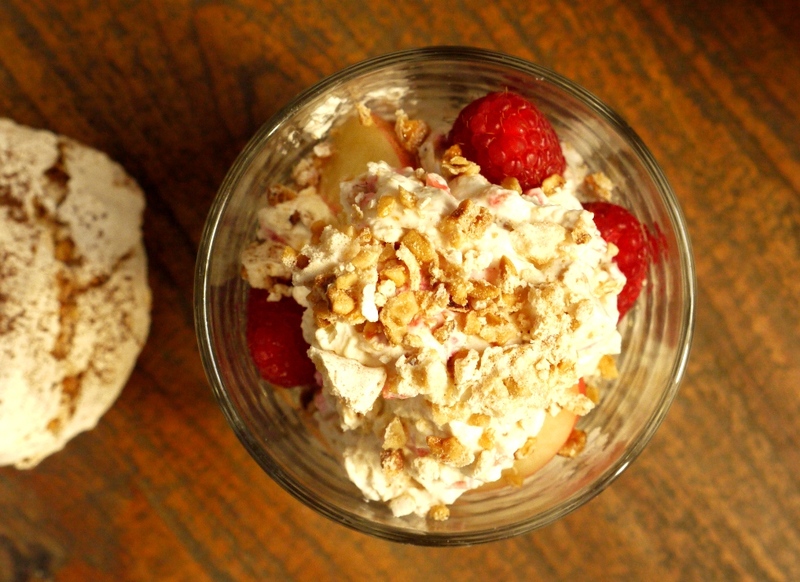 Daisy – you have to try eton mess – so simple and so delicious. Leaf – most cookies freeze pretty well, and it means you always have some on hand for emergencies! Scottish Baker – thanks for the tips. I tasted one (ok three) of those scones and they were delicious! My Kitchen Stories – thank you! I made this on the weekend for fathers day (is Australia) and it was awesome!!!! The biscuits were fab and I love a parfait/trifle/mess type dessert so this was perfection!!! I didn’t have cream to whip on hand, but I had some freshly made vanilla bean ice cream (which is where all my cream went!!) that was still soft from churning and I used that instead. AMAZING! The next day I did it with yoghurt. Delicious!!! Just so yummy whichever way I made it! I’ve got some extra biscuits stowed in the freezer (ingenious!) and next time I’ve got whipped cream, they shall be brought out!